There was a YouGov poll yesterday with some post-Florence EU questions, suggesting a pretty poor reception for Theresa May’s speech. The proportion thinking that the government are doing well at negotiating Brexit has fallen from 24% to 21% since last month, its lowest since January. 61% now think they are doing badly, including three-quarters of Remain voters and almost half of Leave voters. The principle of a transition period is broadly accepted – 46% think it is a good idea, 26% a bad idea. The majority of the public also say it would be acceptable for such a deal to include remaining in the single market and/or freedom of movement for a transitional period. The tricker elements to sell to the public appear to be the juristiction of the European Court (by 43% to 35% people say this would be unacceptable for a transition period) and continuing to pay the EU during the transition period (38% acceptable, 42% unacceptable.) 62% of leave voters see paying a fee during a transition fee as unacceptable. Whether they agree with it or not, 33% of people say that the Conservative party’s policy on Brexit is clear – 45% say it is unclear or confusing. While people are not impressed by the government’s handling of Brexit, the public remain pretty evenly divided on whether or not to go. 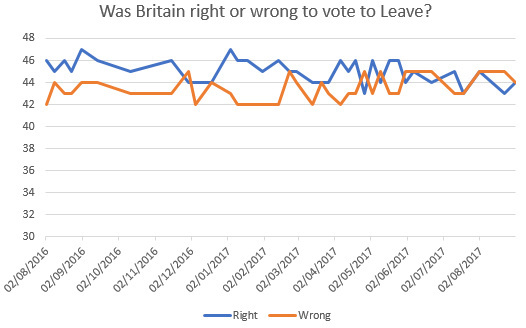 44% still think Britain is right to leave, 45% that it’s wrong (typical of past months). Asked what they’d like the government to do on Brexit 40% think they should proceed with their current negotiating aims, 12% would prefer a softer Brexit, 18% would like another referendum to see if people still want to leave, 14% would like the government to halt Brexit. Changes are from a fortnight ago for ICM, last week for Opinium and the start of September for Survation. One Conservative lead, two Labour leads and no consistent trend in either direction. Survation and ICM were both conducted after Theresa May’s Florence speech, so give us the first chance to gauge reactions to it. Survation asked about whether people supported or opposed paying £20bn to the EU during a transition period when Britain had access to the single market – 34% of people said they would support it, 47% said they would be opposed. ICM asked a similar question, but found 41% of people supported the idea and 31% were opposed – the ICM tables aren’t available yet, so I don’t know what the particularl wording was and whether it might explain the difference. Ipsos MORI’s monthly political monitor has topline figures of CON 40%(-1), LAB 44%(+2), LDEM 9%(nc), UKIP 2%(-1). Fieldwork was over the weekend and changes are from July. Leader satisfaction ratings are May minus 17, Corbyn minus 3 and Cable minus 1. While Vince Cable has the least negative net rating, this is because he has far higher don’t knows than the other two leaders (39% compared to 10%) rather than any great surge of “pro-Vince” feeling. MORI also asked some more detailed questions about perceptions of the leaders’ qualities, underlining the collapse in perceptions of May’s and the rehabilitation of Jeremy Corbyn since last year. In September 2016 Theresa May had better ratings on almost everything (the sole exception was being marginally more likely to be seen as more style than substance). Now there are obvious areas where the two leaders outshine each other – May is still more likely to be seen as a capable leader, good in a crisis (though her leads are vastly reduced – in 2016 she beat Corbyn by 44 points on being a capable leader, now it’s only 7 points), but Corbyn now has strong leads on personality and honesty, and is much less likely to be seen as out of touch. There was also a poll by Opinium at the weekend, which had movement in the opposition direction. Their topline figures were CON 41%(+1), LAB 41%(-2), LDEM 5%(-1), UKIP 5%(+1). Looking at the broader picture, the polls still appear to be clustered around a very small lead for the Labour party. Tabs for Opinium are here.